If you fall through the ice, remain calm and act quickly. Do not remove your winter clothing. Heavy clothes can trap air, which can help provide warmth and flotation. This is especially true in a snowmobile suit. Go back toward the direction you came. That is probably where you will find the strongest ice – and what lies ahead is unknown. Place your hands and arms on the unbroken surface. 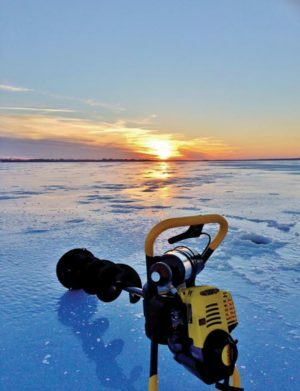 This is where a pair of nails, sharpened screwdrivers or ice picks are handy in providing the extra traction you need to pull yourself up onto the ice. Once back on the ice, don’t try to stand up. Lie flat until you are completely out of the water, then roll away from the hole to keep your weight spread out. This may help prevent you from breaking through again. Get to a warm, dry, sheltered area and warm yourself up immediately. In moderate to severe cases of cold-water hypothermia, you must seek medical attention. Cold blood trapped in your extremities can come rushing back to your heart after you begin to warm up. The shock of the chilled blood may cause ventricular fibrillation leading to a heart attack and death!